Have you ever played Alleyway? What about Breakout? Maybe Pong? (If all this brings Sanrio World Smash Ball to mind, then please comment so we can be friends.) Skorecery is essentially all of those games, only competitive. The thing is, this couch co-op feels like it is only taking its first steps, rather than a full-fledged release. 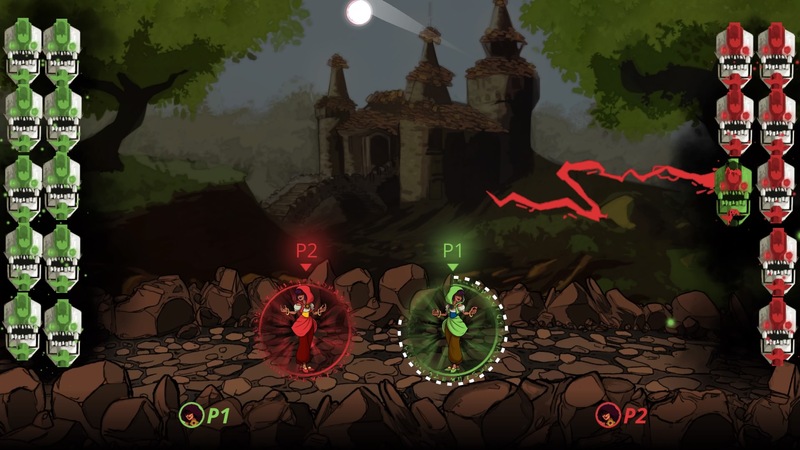 Between two and four players step into an arena filled with runes in Skorecery. Their goal is to destroy as many of the opposing team’s Runes (blocks) as possible, so you can get the highest score. When you or someone on your team grabs the ball, it is charged with your color until it either hits an opposing Rune (if no friendly damage is turned on) or opposing player. You need to have your avatar run along floors and ceilings, grabbing the ball when you can, and shooting it in the right direction to eliminate the Runes. There are essentially two modes, with different variations on the two. The first major one is Exhibition, and there are three ways to play it. 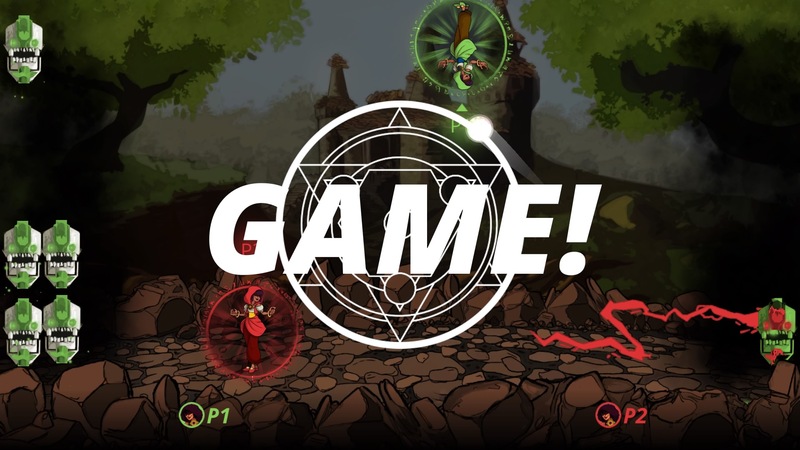 The first is normal, untimed Exhibition, which allows two teams of up to four total players trying to be completely eliminate the opposing team’s Runes to win. Here, you can choose your characters, set their Spells, arrange the Rune layout, and help define everything. 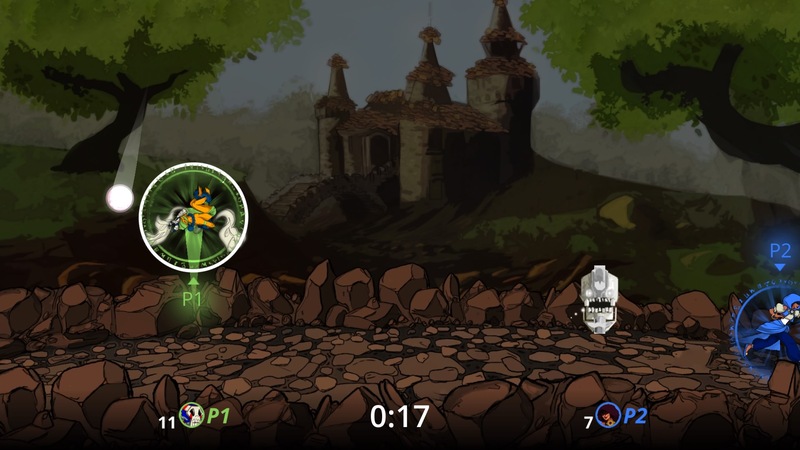 Quick Play is a two-player mode with two teams that uses all the defaults for an immediate, untimed Exhibition match. Shootout is the original Exhibition, except each of the two-to-four players in this untimed match each has only 10 possible shots to make. When everyone has run out of shots, the side with the most remaining Runes wins. The second mode is Goaltender. 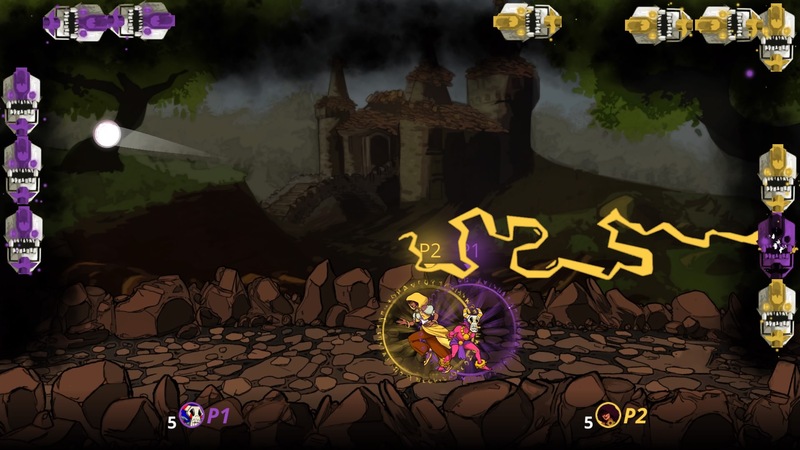 In this two-to-four player mode with two-to-four teams, one Rune appears at a time. You get a point for each Rune you destroy before anyone else before time runs out. It is a more frenzied mode, since everyone is racing for the one ball and trying to block opposing shots. Thankfully, only two teams are allowed here, as four teams would have made it far too chaotic. Even still, when more than two people are around, it can prove quite difficult to find enough space to even make a successful shot. This means there isn’t much variety in Skorecery. If you don’t like this mode or that mode, then all you have are a few different takes on the first mode again. It becomes something of a theme. Character choices are very limited in Skorecery. Only two characters are available in the game at launch, There is The Mystic and The Necromancer. Their differences seem to be purely cosmetic, with the Spell types that can be selected offering the real variety here. Considering that up to four people could play, it seems odd that there aren’t at least four distinct avatars available at launch. It is disappointing to see so few designs. They also share a spell set, and there are four spells total. The first spell is Ethereal Hand, which lets you make a portal where, if the ball goes there, you can press the right trigger to grab it even if you are far away. Lockdown stops the ball where it is, so you have an easier time of getting it temporarily. There is Speed, which temporarily speeds you up. You can set up The Wall, which keeps the ball and players from going through it. Speaking of Spells, there are also general Curses that can be turned on or off. These alter the way the balls and Runes behave. For example, a Stun Beam can be toggled on and off, to possibly stun an opponent when they are destroyed, and you can reinforce Runes so they aren’t destroyed with one hit. The ball could or could not be affected by the power of gravity, and you can toggle if it become neutral after destroying a Rune. These variables can add extra flavor to matches. The most disappointing part of Skorecery is that this is a game that forces you to play with other people. While the Tutorial and Practice modes only require one person, the Exhibition, Goaltender, Quick Play, and Shootout modes all require at least two people. If you don’t have at least one other person sitting next to you on the couch, you aren’t going to be able to do anything. Having no option to play against an AI can make Skorecery feel incomplete. It makes the game feel far more rudimentary than it is. Worse, the two sections that do only require one person aren’t really all that helpful or fun if you are alone. The Skorecery Tutorial is brief, only offering a look at the basic controls. It tells you about the spells your avatar can use, but doesn’t explain what those spells are or do. The Practice Mode only helps if you have someone else around to challenge you and help you learn, otherwise you are just aiming the ball at runes and watching what happens. Skorecery review code provided by publisher. Version 1.0 reviewed on a standard PS4. For more information on scoring please see our Review Policy.